JETmotion – Leibinger – Innovative Marking Systems, Inc. The traverse system for LEIBINGER inkjet printers. The JETmotion traverse system makes it easy to mark stationary products. To do so, a JET3up or JET2neo print head is installed on the automated linear slide or movement axis, where it moves vertically. This allows single or multiple products to be printed in a row. Product examples include tubes, PCBs, electrical and electronic components, steel or plastic products, profiles and packages. 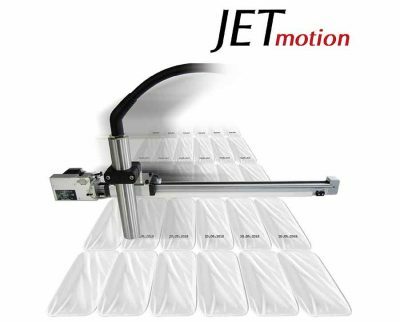 The JETmotion movement axis can be used within packaging machines, intermittent motion machines or as a stand-alone solution. Ideal for the JET3up and JET2neo series!